We are going camping tonight for the first time with our little guy. I am hoping we sleep... but I am also looking forward to doing some fun activities this evening and in the morning in the outdoors. 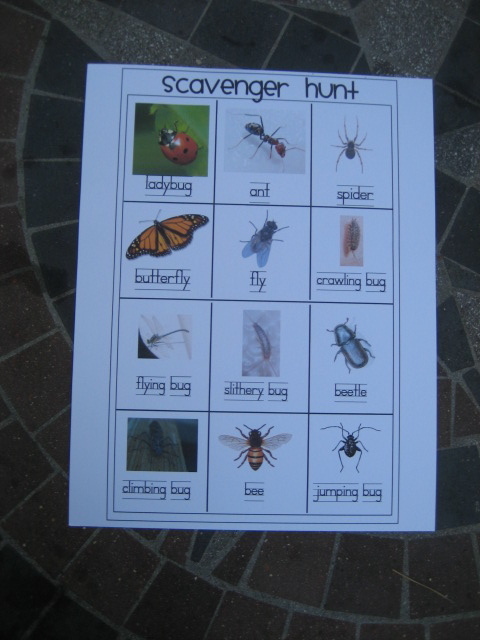 Our Creepy Crawlies Scavengar Hunt and Critters Hide & Seek Activity will be perfect to do in the morning. There are never a shortage of bugs when camping! I'm also thinking tonight we might have to do a Flashlight Bug Hunt. Materials Needed: flashlight, container to catch some bugs (with holes at the top), shovel/trowel, banana or brown sugar, and a notebook to write down what we find or draw pictures of the bugs. Directions: When it is light outside, put sugar or squish up banana and stick it onto a tree. Wait and watch to see the bugs come! Count them up. Try again when it gets dark and use your flashlight to find the bugs. Count them up and see if there are more or less bugs when it is dark. Our Hiking Scavengar Hunt and Color Bingo game will also come in handy when we go hiking around tomorrow. 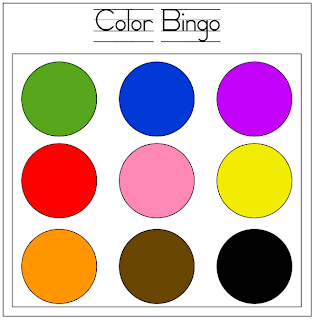 Make sure to add white to your list of colors if you use this... although it didn't fit on my color bingo board, it is definitely a color you'll find in the outdoors. One new activity I created for our camping trip is a Camping Scavenger Hunt card. - Hunt (or just watch) for the animals and objects on the card and cross them off with a marker (hopefully we won't see any raccoons :)). - Hunt for the animals and objects on the card and put rocks on top of the picture of each one that you find. 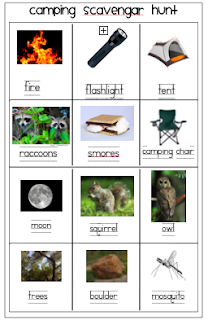 - Tell your child the sound that the object/animal makes and have them cross off the correct animal/object once they figure out the sound that matches (obviously the boulder might not have a sound... but you could say, "Can you find the object that makes a zipping sound"... and they'd probably guess the tent... then they can cross off the tent. 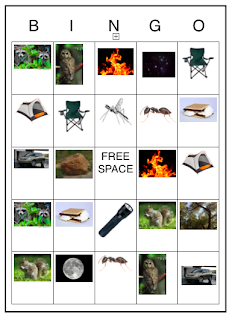 I also created an M&Ms Camping BINGO card... because you can't go camping without M&Ms and trail mix :) I figure we'll steal some M&Ms from our trail mix (or just play with trail mix). We just plan to play this by printing off an extra card set and cutting it up and making picture cards. Then I'll show my little guy the picture cards and he has to find the correct picture on the BINGO board and then put an M&M on top! Nice and easy. I doubled up some of the pictures... so that the game will go a little faster. There are a lot of images on this card... so my son might need some help from me or his dad to find the pictures... but we'll see how it goes! I re-organized the pictures and created two other boards so that more than one person can play. The rest of our activities will probably including hiding in our tents, exploring in the dark with flashlights, hiking, and making meals. Every minute of our camping trip will be an opportunity for language building because it will be such a new experience for my little guy. I can't wait! 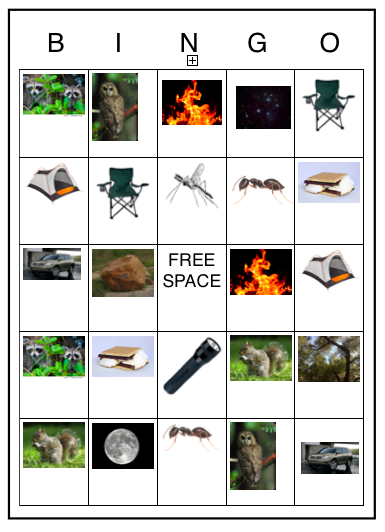 If you plan to go camping soon and want a copy of my scavenger hunt or BINGO cards, just comment with an email address and I'll pass them along! Hi, I'm Liz and I'm your newest follower! We are going camping tomorrow and these would make me the coolest Mom there. Can you please email the scavenger hunt and bingo cards please? tara.alamode.harrison@gmail.com Thanks!! awesome ideas, i'd love a copy of your scavenger hunt and bingo cards. thanks. awesome ideas, i'd love a copy of whatever you've got for camping. thanks! love love... going camping next weekend with little ones... Could you please email me the scavenger hunt and bingo cards jeanmoran2010@gmail.com ! THANKS!! I think I've emailed everyone up till this point. If I forgot someone, let me know! We are taking our grandsons camping in Colorado next month--ages 2 and 4--would love any help you can suggest--we raised 2 girls who loved to read in hammocks and watch the stream bubble over rocks--somehow I don't think these two will settle for that! I love your printables! We are camping in two days... Could you please send them to elisabethcarroll@hotmail.com? Can't wait to play these on our camping trip this weekend! Thanks for sharing! Could I please have copies of the scavenger hunt and the camping bingo for my class. My email is mpaul67@hotmail.com. thank you very much.